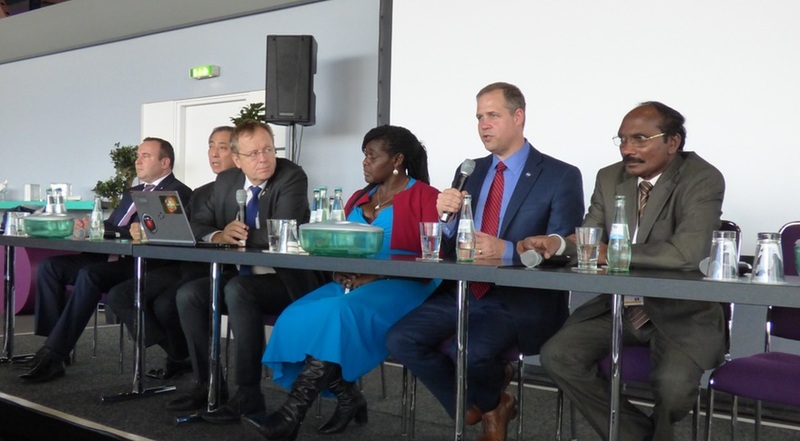 BREMEN, Germany — A Russian space official said Oct. 1 that while his country is interested in lunar exploration, it’s not satisfied with participating in NASA’s lunar Gateway program as currently structured. Speaking on a panel at the 69th International Astronautical Congress here, Dmitri Loskutov, head of the international cooperation department at the Russian state space corporation Roscosmos, said he had issues with the Gateway as a NASA-led project rather than a partnership more like the International Space Station. Loskutov suggested that if the Gateway was run as a NASA-led program, Russia might not be interested in being a partner. Loskutov’s comments are similar to those made by his boss, Roscosmos head Dmitry Rogozin, last month. Rogozin said at one meeting that “Russia simply cannot afford to take a back seat in foreign projects” like the U.S.-led Gateway, according to a report by the Russian news service Tass. A Roscosmos spokesman later clarified that Rogozin was not saying Russia would not participate in the project, at least not yet. NASA Administrator Jim Bridenstine, interviewed at a Washington Space Business Roundtable luncheon Sept. 24, said he had not heard any criticism about the Gateway from Russia or other potential partners. “I have not heard anybody at this point, including Russia, indicate that they did not want to be part of our activities to get back to the surface of the moon,” he said. During a panel discussion here Oct. 1, representatives of several other space agencies expressed an interest in working on the Gateway in one form or another. The exact plans for doing so, including what contributions each agency will make, have yet to be worked out. “There’s a process we’re going through right now,” Bridenstine said at a press conference after the heads-of-agencies panel. “We’re formulating what the architecture will look like, and then we’re looking at each of the space agencies and their capabilities, and we’ll be incorporating those capabilities into the architecture.” He didn’t give a schedule for making such decisions. Bridenstine said that the Gateway is intended to support human exploration of the moon by NASA and international and commercial partners, likening the facility to a reusable command and service module. That could fit in to the concept of the “Moon Village,” a broad partnership of agencies and companies supporting lunar exploration long espoused by Jan Woerner, director general of the European Space Agency.